Snag this super fun trio of Angry Birds dog toys while they are on sale here for more than half off! Get all three for just $20 including free shipping. They are the official characters and when you squeeze these 4” plush balls, you’ll hear them come to life with the real Angry Birds sound effects, too! Find loads of great pet deals including Bully Sticks, Zuke’s Treats, KONG Toys and more, all with free shipping at doggyloot.com. Angry Birds T-Shirts for Dogs $14 + Free Shipping ($29 reg)! These Angry Birds t-shirts for dogs are SO cute!!! And right now they are Half Off, too! Regular price is $29 but you can get one in your choice of blue or green for only $14 including free shipping. Three sizes are available so visit Petching.com for details and more great daily deals for pets! 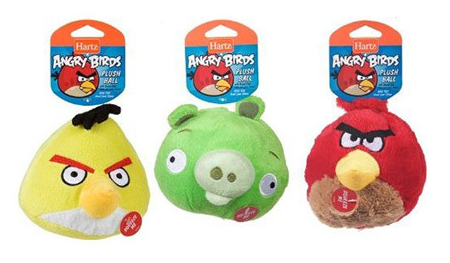 Giveaway: Hartz Angry Birds Pet Toys Instant Win and Grand Prize Game! Are you addicted to playing Angry Birds? 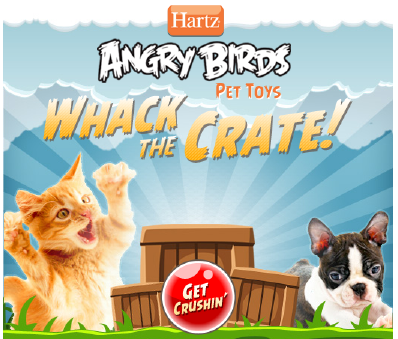 Play the new Hartz giveaway game on Facebook for a chance to win the $250 Prize Pack of Angry Birds pet toys or one of several Instant Win Daily Prizes!